I actually like to make this with the cranberry chutney. It's very easy to make if you have already prepared the chutney...simply put it in a blender with some vinegar, garlic and Habanero. A hand blender (see below) works great for this recipe. When blending, do not incorporate too much air into the sauce. Put everything in a blender or the bowl of a hand blender and blend until smooth. Put into a jar or squeeze bottle and refrigerate. Cook the first four ingredients for about thirty minutes in a saucepan over medium low heat. Put in a blender or the bowl of a hand blender with the last three ingredients. Blend until smooth. Put into a jar or squeeze bottle and refrigerate. A hand blender is more than just a compact version of a stand blender. Its signature identity and best feature is the fact that it goes directly into the food you wish to blend. It can be used to blend vinaigrettes, sauces, frozen drinks, and is great for pureeing soups (simply immerse it in the soup and let it rip, making it safer and easier than having to transfer hot batches to a stand blender). The hand blender is also useful for making homemade mayonnaise (or aïoli) with the special bowl it comes with. 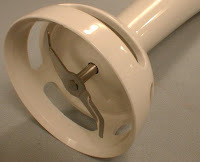 Hand blenders are made up of three parts: the motor is housed in th e handle area; the blending rod can be plastic or stainless steel and is sometimes detachable (detachable rods are very handy when it comes to cleaning); and the foot contains the blade. When it comes down to it, any blender can puree at least decently, So what to look for is comfort in handling, ease of use and cleaning, and variable speed control is nice too. As you can see from the picture and by clicking on some of the links below, you can get them with various other nifty attachments. 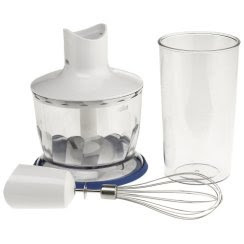 I especially think the whisk attachment would be nice to have when emulsifying a vinaigrette or making hollandaise sauce. Also the chopping attachment could take the place of a small food processor.